Yoga instructor John Wylie at the yoga studio inside AFC Fitness Bala Cynwyd. Crouching yogi, hidden martial artist: Before practicing yoga, Wylie competed in martial arts and earned his black belt in karate. "I got beat up by some of the best martial artists in the nation," he said. Hands on: Wylie's students swear by the massages he gives out while they're holding poses during his class. When John Wylie began taking yoga classes on the advice of his chiropractor, he didn't tell his fellow officers at the University of Pennsylvania Police Department. "I saw it as being a soft art," Wylie said. "It took me a while to dispense of that machismo kind of thing." But as Wylie's passion for the ancient Indian discipline and the inner peace it brought him grew, his fear and machismo melted away. He not only started talking about yoga, he began teaching it at Penn while also policing its campus. In 2016, after three decades in law enforcement, Wylie left policing and became a full-time yoga instructor. John Wylie instructs a class at AFC Fitness Bala Cynwyd. 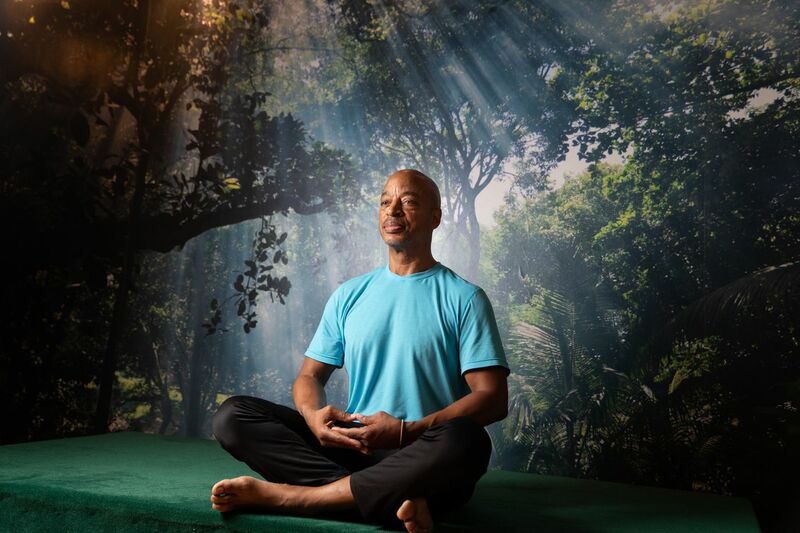 "My yoga was becoming more of who I was than the policing was," he said. "What I'm doing now is obviously where my heart is." The ultra-flexible 58-year-old grandfather teaches up to five yoga classes a day, and he's got a fervent following of students who swear by his smooth style and serene disposition. "He makes you feel comfortable," student Phyllis Liebert said after a class at AFC Fitness in Bala Cynwyd, one of the five locations where Wylie teaches. "He'll come over and hold me once in a while. That's all you really need, some stability sometimes." Yoga Instructor John Wylie and student Phyllis Liebert during one of Wylie’s yoga classes at AFC Fitness in Bala Cynwyd. Wylie grew up in East Mount Airy, attended Chestnut Hill Academy, and got his undergrad degree from Franklin and Marshall College. Though he'd never considered policing before a job on Penn's force opened up in 1986, Wylie saw it as an opportunity for full-time work while he obtained his master's degree. What he got was an education in the classroom and on the streets. While working at and attending the Ivy League school, Wylie was policing in a West Philly neighborhood that was far more racially and economically diverse than Penn's campus. Wylie helped victims navigate the legal system. He saw children commit crimes. He even ran into a gunfight once. Luckily, he never had to fire his service weapon. And thanks to yoga, he never will. When Wylie began taking yoga classes in 1999, he was shocked to find yoga more physically demanding in some ways than martial arts — which he had practiced for 20 years. He was also surprised by how yoga challenged him mentally and spiritually. Wylie said yoga helped him recognize his low-level anxiety and, more important, that he had the ability to change it. He became more compassionate with people and more clear in stressful situations. "So once I started yoga, the way that I was policing also developed and changed, too, so I was not as reactive in terms of some of the things I was doing," he said. "I was not as kind of excitable, not as hyped up as I might have been." No pose is too much of a reach of yoga instructor John Wylie, who used to work as a police officer. He felt compelled to share what he'd learned. "I began to feel so open and so good about what it was giving me that I said to myself, 'This should not just be for me. I definitely need to try and provide this to as many folks as possible, and in particular, to people of color,' " he said. Wylie noticed that in yoga classes he attended, he was not only the only man, but also one of the only people of color. He wanted to change that. As Wylie moved from practicing to teaching yoga, he began offering classes to students and staff at Penn. He also tried to host classes for his fellow officers, "but it wasn't too well-received," he said. He wasn't deterred. Wylie wrote papers on the benefits of yoga for police officers, and spoke at law enforcement conventions. But yoga wasn't the juggernaut it is now, and while people started to catch on, his yoga-for-cops idea never really took off. Yoga instructor John Wylie is known for his hands-on approach to teaching. But over time, Wylie found a strong and diverse force of his own — a community of students from North Philly to Bala Cynwyd who love his method, manner, and mind. From chair yoga for those with limited to full mobility, to Pilates, meditation, and fluid power yoga, Wylie cares for each class like it was filled with old friends. For a man who used to tell people to stop and put their hands up, being able to tell people to breathe and bring their hands to their heart has been remarkable. "My life is such a blessing and a gift of extraordinary experiences," he said. Grandma Linda Harris has "seen it all" while guarding risque exhibits at Philly's Institute of Contemporary for 16 years. Bob Gable, the Bucks County Batman, fights petty crime in a $12,000 Batsuit.